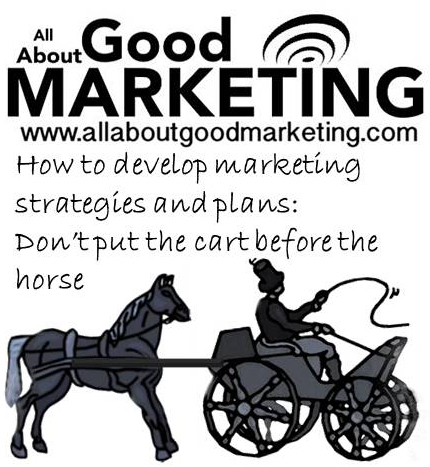 Marketing Strategy and Plans: Are You Putting The Cart Before The Horse? All too often, people talk about their marketing strategy, and mention things like thought leadership, lead generation, social media and digital marketing. All of these things are great, but the word strategy is often misunderstood as being the same as a plan, or list of activities. It’s easy to see why: the Oxford Dictionary defines ‘strategy’ as “a plan of action designed to achieve a long-term or overall aim”. But the focus of the definition should not be on the word “plan”, but on the words “long-term aim”. For example, you could outline all the events, webinars and advertising you are planning to do in a given year, and think: “Voila, there’s my strategy”. If you follow this approach, the danger is that the marketing plan will amount to nothing more than a laundry list of unconnected activities. That’s why you need a clearly-defined strategy which then informs your marketing tactics. It’s not enough to simply outline all lead generation activities and then declare that this is the strategy that supports the business objective of ‘meeting our sales targets’. What happens if your marketing plan contains only tactics, and no strategy? A lack of strategy will often result in carefully planned marketing campaigns yielding poor results, for example because they are not targeted at the right segment, or because the messaging is not supported by the product’s actual positioning. So what is marketing strategy? Let’s pick an example that most people will be familiar with: Think of a cheap fashion retailer like H&M or Primark compared to a designer brand like Calvin Klein or Stella McCartney. The mass distribution clothing line will have a completely different marketing strategy than a high-end retailer that prides itself on the quality of its materials and the uniqueness of its designs. Some of the tactics deployed by the bargain basement retailer will be similar to ones used by the more exclusive apparel retailer: they will run TV and magazine advertising campaigns, exclusive previews, promotions and special displays before major holidays and discounted offers at the end of each season. Yet their strategy is different, because the STP (segmenting-targeting-positioning) element of their marketing plans will differ vastly. Each clothing retailer will design its marketing and communications activities to appeal to a specific target group and support its competitive positioning. In H&M’s case, the growing appeal and short lifecycle of cheap of-the-moment clothes means that the company can continue to sell more of the same products to its existing target audience (market penetration) The Swedish giant is also pushing into new markets by expanding its eCommerce capabilities and presence in emerging markets like India (market development). In this case, H&M’s objective is to gain more marketshare for its existing products, and its strategy is to penetrate existing markets more deeply and also develop its presence in new markets. The chosen tactic, on the other hand, is ecommerce. Ecommerce is not the strategy, it is merely the chosen channel or tactic. This entry was posted in Marketing, Marketing Plans, Marketing Strategy and tagged Buyer persona, market segmentation, marketing plans, marketing strategy, positioning, Targeting. Bookmark the permalink. This time it’s personal: Can B2B marketing satisfy the emotional needs of a new generation of B2B buyers?